It's been raining here in Northern California for about three weeks. The newspapers were complaining about the drought and now they're complaining about cabin fever. And they still say there isn't enough water. The chronic negativity of the media seems to be unconscious, bouncing from one negative thought to another. It's one big, collective, “Yeah, but…” It's like that one sad-sack person in your life that you're trying to avoid. Yesterday, after reading the morning paper, I needed some fresh air. The rain wasn't going to stop for me so I bundled up and went to the park with my camera. There was plenty of fresh air. And fresh hail, rain, thunder and lightning. Photographing in the rain is a very special experience, if not the best thing for your camera and lens. Reflections dance, play, and shimmer just about everywhere. Drab concrete is transformed into a palette of light, color, and form. I always look for one photo-of-the-day. I found it in the skateboard park. 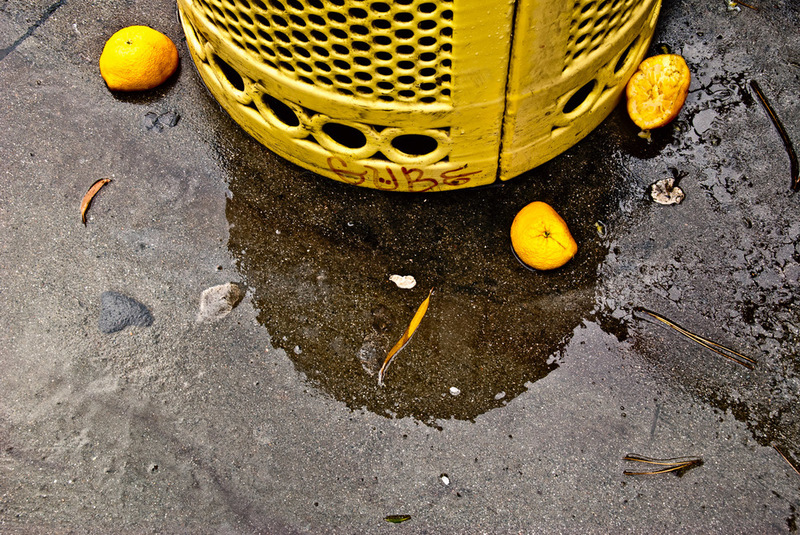 Someone had squeezed three wedges of lemon and discarded them around a yellow trash can. A still life had been created…just for me. Some think of still life as a pristine and picturesque composition, idealized fruits, vegetables, and flowers. The Italians are less romantic about it. They call still life natura morta, dead nature. The truth is that artists have been fascinated for centuries in the slow decay of plants and animals. The Louvre possesses a noteworthy painting of Rembrandt's called Carcass of Beef. Chaim Choutine made a career of painting dead carcasses and had a Carcass of Beef of his own. I like to find still life in the wild. I have this notion that there are elves that create them for me and that I simply must go out on a treasure hunt and find them. They are often exquisite and messy and in various stages of decay—a glorious mishmash of existence. And today I share it with you my latest discovery, Still Life with Three Lemons.